We Brits are lucky. Until we went metric in 1972, for centuries we had the harmonious measurements that resonated with ourselves and with the earth. But the French didn’t. They had so many different sorts of measurements, it was confusing, open to abuse and corruption. So a French Bishop named Talleyrand decided in the 1790s that they would have the metre. He did ask Britain and America to go along with them, but we had more sense and declined, so they decided to go it alone. They declared the metre would be one ten-millionth of the distance between the North Pole and the Equator via Paris. Unfortunately when they tried to measure it, they got it wrong! According to our speaker on Saturday 23rd January, in a talk titled “Sacred Geometry Made Simple – the relationship between everything, and everything in harmony”, metrication is based on an inaccurate calculation by the French and should never have happened. The metre is totally inaccurate and isn’t in harmony with anything. Our own measurements were officially designated British Imperial Units in 1824, but they originated centuries before that as lengths based on our bodies. The inch was the length of the first joint of a man’s thumb. A foot was - you guessed it - the length of his foot, proportionately 12 thumb-lengths. The yard was from the nose to the tip of the middle finger, into which three feet just fitted. The ell was from fingertip to elbow, similar to the Egyptian cubit. 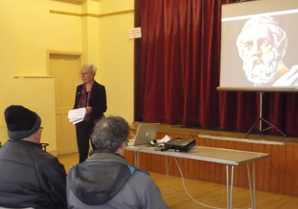 Slimbridge Dowsing Group’s talk on Sacred Geometry began with Plato, Pythagoras and Euclid, famous for their mathematical prowess. In the Bible, Noah was told to build the Ark 300 cubits long by 50 cubits wide and 30 cubits high. With cubits, you can see the harmony, their ratio in relation to each other. Six times longer than it was wide. Ten times longer than it was high. It’s obvious. The same applies when the Ark’s cubits are converted into feet – 450 x 75 x 45. Again you can see the ratio, the sacred proportions. Yet if we convert cubits into metres, it becomes meaningless. 137.16 m long x 22.86 m wide x 13.716 m high. That doesn’t convey very much all.